Before the workshop itself all participants have been asked (by email) to prepare some input for the workshop. Coming up with few simple management stories and classifying them as particular way of management kept me thinking during my airport waiting time. Event was hosted in Ibis Warszawa Reduta Hotel, place was nice enough. 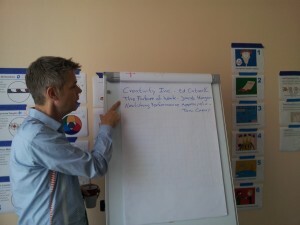 There were 27 participants, which according to Jurgen, was biggest workshop so far. He told us at the end, that he slightly adapted the form to fit this new challenge, but core of the workshop remained unchanged. Catering we got was really nice, general conditions in the room(air conditioning, acoustic) were also good. Workshop was led without any slides/presentation. Almost all visual aids were printouts of illustrations from his latest books, attached to the wall with tape. This is different from what I’m used to, but worked very well. There was no need to blind the room, therefore there was more light (it was nice weather outside), which made it easier to stay awake through the day. Program consisted of roughly same stuff that you can find in “Management 3.0 Workout” book, enriched by some additions that didn’t make it into the book. Participants were spitted into smaller, 4-5 person groups. During the course of the day these groups have been given couple of few minutes long exercises corresponding to currently discussed theme. After some of these exercises results were aggregated and compared with results from other groups. Seeing the differences have often let to the discussion. Participants were mildly active in these. Normally I wouldn’t be content about this, but as mentioned before group was quite big, so it played out to be an advantage. It let the host to follow planned time frame and let me to ask most of my questions without compromising it :-). Parts in which only Jurgen was talking were also very good, talking experience shows itself very nicely. Despite not having good night sleep and having more than usual stress about matters that I have left at work, I was able to stay fully engaged. I read this as a sign of professional preparation of this workshop. During the course of the day just enough brakes were taken, as for me at least. During them I had few interesting discussions with other participants over a cup of coffee and a piece of pie. Of course having recognized authority like Jurgen to consult some ideas was very beneficial pleasure. Guy is delight to talk to, same as his books he is very down to the ground even on abstract matters, very informative and without shade of arrogance. From what was communicated Jurgen stays at disposal of workshop participants also after the workshop. I wish I could stay longer and benefit from more discussion, unfortunately I had a plane to catch. Therefore I only had time for short casual chat after the workshop. There are also handouts and some optional after-workshop activities, but I won’t reveal any details about that, let this be surprise and allure for your attendance. As mentioned program of this workshop is mostly covered by the book, that I have already read. Not that there was nothing new. For example I haven’t heard about OKRs before. My knowledge level about sane management didn’t double after this workshop, but depth of understanding definitely increased. All three parts: Jurgens presentation, group exercises and free discussions contributed to that. I spent really great day, leaving significantly more motivated than I came in, having new stories and analogies to engage and convince people around me. As an effect I already set up lunch with two of my bosses, to talk with them about what we can do in few domains that we are lacking in (at least I think so). My overall opinion is 8.. or maybe even 9/10.